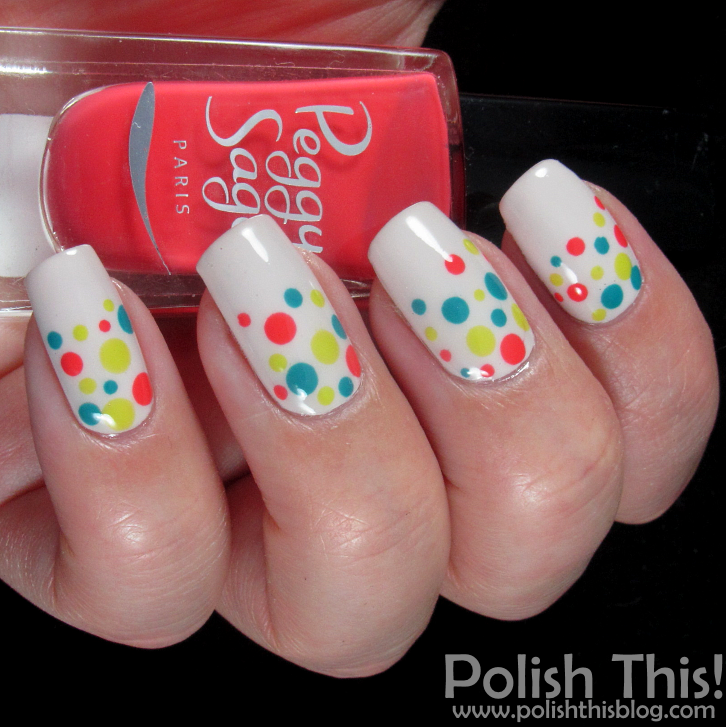 Peggy Sage Dotticure - Polish This! Hiya all, I have a quick and simple nail art look to share with you guys today! I received some Peggy Sage polishes for review from the Finnish Peggy Sage importer and beauty store Meikit Heaven. This is my first time trying anything from Peggy Sage though I had previously seen some products from the brand but I had never tried anything myself. I received four polishes and three of those looked like they really needed to be used in one manicure together. They looked so juicy next to each other! So I decided to a simple but always so pretty dotticure with the three polishes. I used Essie Urban Jungle as my neutral base color and then I did the dots with couple dotting tools and the three Peggy Sage polishes. The green one is called Kiwilicious, the teal one is Sorbet Curaçao and the coral one is Fresh Coral. I really liked this manicure, sometimes the simplest ideas and designs just work the best! These three polishes looked just as juicy together on nail as they did in the bottles and at least in this dotticure all three seemed like quality ones. However, I haven't tried them alone yet. I quite like this angular bottle and I love the fact that these have the names on top of the caps. The one thing I don't like about these is the fact that the as the caps are angular too if you close them properly, they don't align with the bottle. I hate that, I wish they had the similar systems as for example IsaDora's have where the cap locks into place so that it's always aligned. It's really a small thing but it makes the difference for me. Other than that this was overall a really pleasant first experience with Peggy Sage and I look forward on trying out these polishes more. Disclosure: I have gotten these polishes for review. For more information view my disclosure policy. Söpöt on kyllä nämä pallokynnet! :) Ja mua ärsyttää kanssa hirveästi kun toi korkki jää väärällä tavalla kiinni >:( Dollish Polishien kanssa on ollut vähän sama juttu.. I like Peggy Sage - indeed wide gamut and good enough characteristics. The only thing is like you mentioned - caps are angular.